Licensed Plumbing Contractors, Plumber, Plumbers Serving Sacramento, West Sacramento, Freeport, Rancho Cordova, Carmichael, Roseville, Rocklin, Lincoln, Loomis, Penryn, Newcastle, Auburn, Granite Bay, Folsom, Citrus Heights, Orangevale, Fair Oaks, Rio Linda, North Highlands And Antelope. Sacramento Plumbers Servicing Roseville, Rocklin, Lincoln, Citrus Heights,Rancho Cordova & Folsom. If you've noticed a sudden increase in your water bill or puddles forming in your yard when it's not raining, you may have a leaking or broken water line. Water lines can crack or deteriorate from a variety of unavoidable environmental conditions, and most people don't realize that maintenance of the water line, which runs from your house to the street, is the homeowner's responsibility. Fortunately, a rapid response can prevent thousands of dollars worth of damage to your property and hazardous backflow. At ROOTER GUYS... A Better Plumbing & Rooter Service, we specialize in and frequently perform sewerline and waterline repairs & replacements, so you can rest assured that your sewerline or waterline will be serviced by experienced plumbing contractor. So whether you suspect you have a problem with your sewer or waterline or you just want to run a routine inspection, we have the expertise and knowledge to get the job done in a thorough, timely and cost-effective manner. For more information or to schedule an inspection, please contact ROOTER GUYS today! 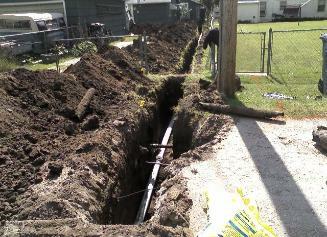 Sewer Cleanout Installed In Carmichael CA 95608.